Puzzles and phlegm, puzzles and phlegm, I'm gonna get me some puzzles and phlegm! That's the theme for this week's Nintendo WiiWare and Virtual Console combo update, with two from menu A and one from menu B showing up on your Wii console for purchase at any moment. Kicking things off on the WiiWare side, Sodoku Challenge (500 points) teams up with RealArcade's Boingz (1,000) points, which features stretchy aliens (or condoms, if you prefer) you can flick through 30 levels of puzzle platforming goodness. 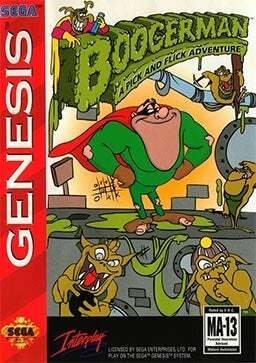 So you have straight up puzzles, a puzzle-platformer starring sacks of goo, and then the original sack of goo platformer, Boogerman: A Pick and Flick Adventure for the Sega Genesis (800 points). Flick boogers, fart toxic clouds, belch fire, and basically act like me while no one is looking in order to somehow save the day. Do not worry, true believers; I only use my powers for good. WII-KLY UPDATE: TWO WIIWARE GAMES AND ONE VIRTUAL CONSOLE GAME ADDED TO WII SHOP CHANNEL Nov. 24, 2008 This week, it's all about you. By adding three new single-player games to the Wii™ Shop Channel, we're helping gamers turn their Wii time into "me time." That said, don't be surprised if you attract a crowd of onlookers with this remarkable lineup. From elastic critters and elaborate puzzles to a hero with highly questionable manners, these solo titles are suitable for sharing, but give your friends and family fair warning: They may have to wait a while for their turn once you've gotten a taste of the single-player fun. Nintendo adds new and classic games to the Wii Shop Channel at 9 a.m. Pacific time every Monday. Wii owners with a high-speed Internet connection can redeem Wii Points™ to download the games. Wii Points can be purchased in the Wii Shop Channel or at retail outlets. This week's new games are: WiiWare™ Boingz (RealArcade, 1 player, Rated E for Everyone, 1,000 Wii Points): Stretch, flex and flick your way to freedom. A truly mind-bending experience, Boingz introduces you to cute, colorful, stretchable friends lost in an alien world, searching for the magical gates that will take them home. Boingz springs to life with 30 levels of puzzle-platforming fun. The Boingz are bendy little critters that can be pulled, stretched and flicked from place to place like rubber bands. It's a team effort, as all the Boingz will have to work together to unwind the game's puzzles. What's more, many of the Boingz have fallen into a deep slumber, and you'll have to lead the stronger Boingz to find and wake up their sleepy friends. Explore surreal landscapes, sail through the air like a trapeze artist, walk along the seafloor, and collect the Twinklies to power up your elastic-powered flights. Sudoku Challenge! (Digital Leisure Inc., 1 player, Rated E for Everyone, 500 Wii Points): Now's your chance to play the brain-busting puzzle game taking the world by storm. With over 100 million Sudoku puzzles, you'll never see the same puzzle twice in Sudoku Challenge! You can select the classic nine-by-nine Sudoku game boards as well as Grand Sudoku, which challenges you to complete five intersecting Sudoku boards simultaneously. Just a beginner? Don't worry-with three difficulty options, even a novice player can complete a Sudoku with ease. But if you're a seasoned pro, challenge yourself in Expert mode and test your true skills. It's time to get your thinking cap on and see how many Sudoku puzzles you can conquer. Virtual Console™ Boogerman™: A Pick and Flick Adventure (Sega Genesis, 1 player, Rated E for Everyone-Comic Mischief, 800 Wii Points): In this top pick from the Sega Genesis, play as Boogerman, the heroic alter ego of Snotty Ragsdale. While investigating Professor Stinkbaum's lab, Boogerman stumbles upon a strange machine that opens a portal to another dimension. Boogerman has a nose for adventure, but has he met his match in this sticky situation? Journey through dangerous worlds while battling wicked enemies like Fly Boy and Deodor Ant. Deal them a blow with Boogerman's super abilities: pick and flick with deadly precision, belch, and use his deadly signature stomp. For more information about Wii, please visit wii.com.